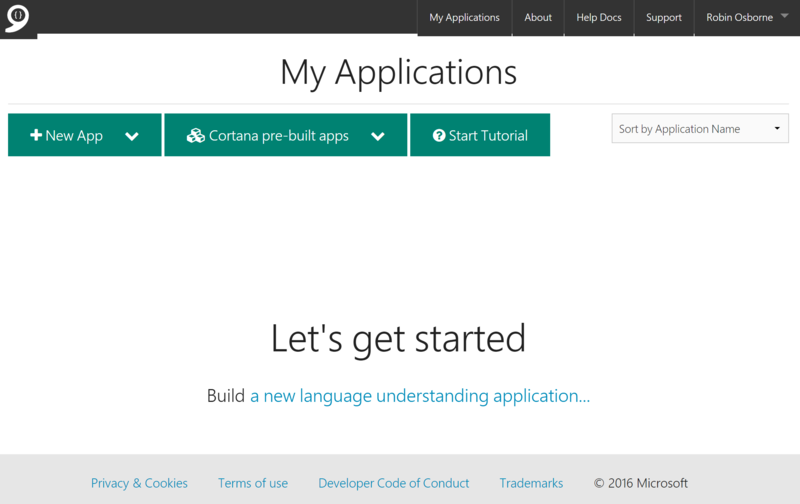 Creating a hosted bot using Microsoft’s botframework couldn’t be easier; hopefully you’ve had a chance to create one already, and if not there’s a great introduction to creating your first bot right here. 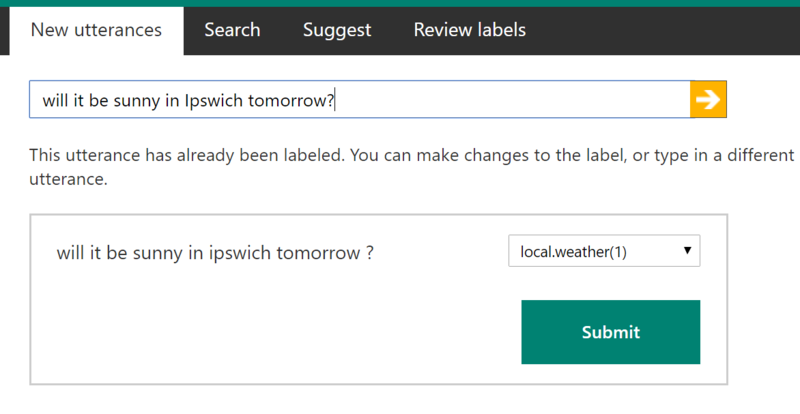 In the previous article we saw how to create a QnA (aka FAQ/Knowledge Base) service using a little known QnA Maker service of the botframework. In this post we’ll start to create a more intelligent bot; one which can appear to understand the intent of the incoming message and extract specific key variables from it. Understanding the intent of a piece of text is a really tricky problem to solve; totally out of scope for this article, and for most bot projects! Luckily, the botframework has a friend called LUIS – the Language Understanding Intelligence Service. 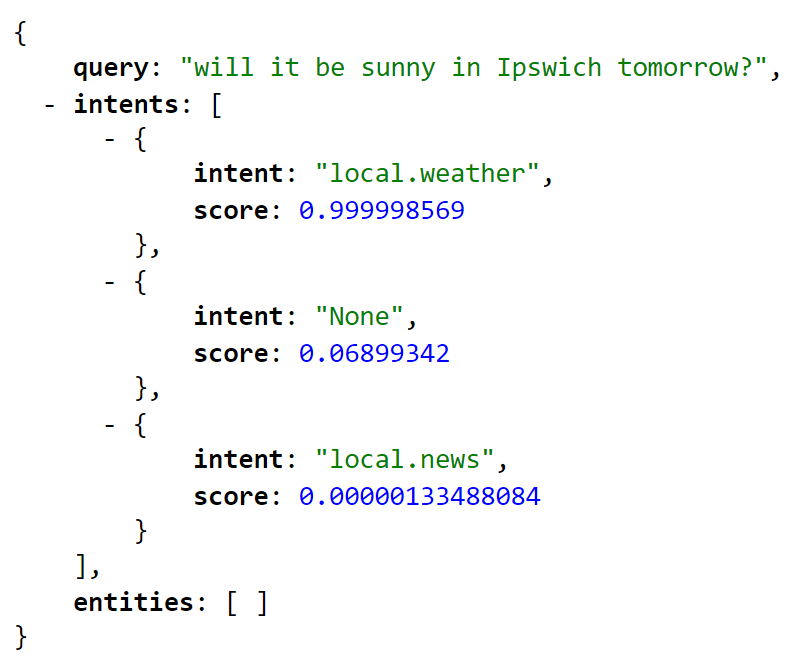 LUIS exists as a standalone product, and can be called with a query (text input) to give a result (matching “intent” with a “confidence” score, as well as any extracted “entities” – we’ll get on to these later). Given this magic, it’s no longer obvious what the entry points are for your application which can make developing and debugging the logic within your bot application really tricky..
We’ll get on to the C# and botframework magic later, but first let’s look at getting started with LUIS and how to use it. Give it a name and choose from IoT, Bot, Mobile Application, or Other (honestly have no idea if this info changes anything; AFAIK it’s just data gathering); I just choose “Bot”. 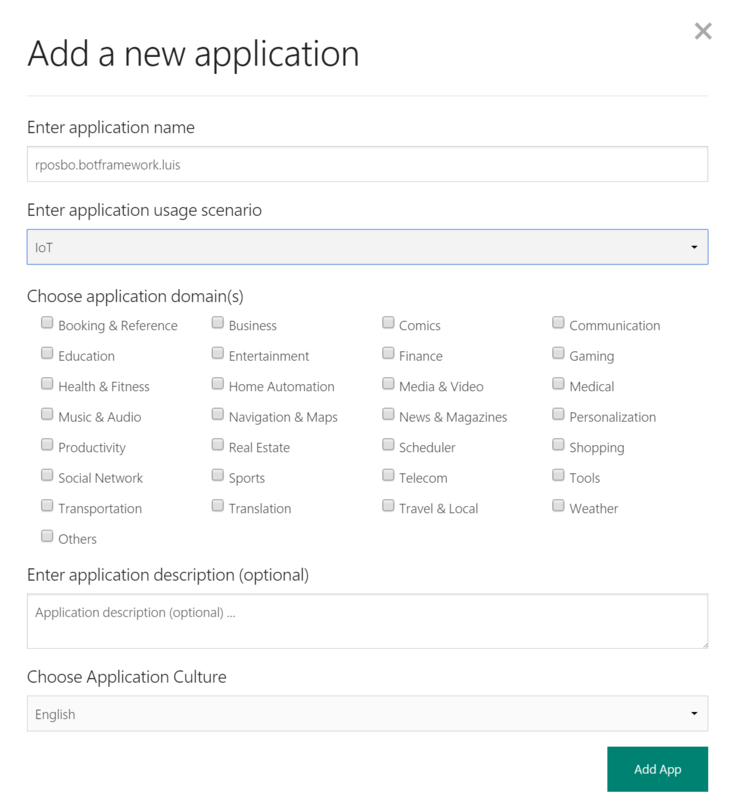 Choose your “Application domains” – again, this doesn’t alter your experience, so just go with whatever you prefer; I chose “Entertainment”. “Culture” might actually be used, but I’ll get on to that in another article. 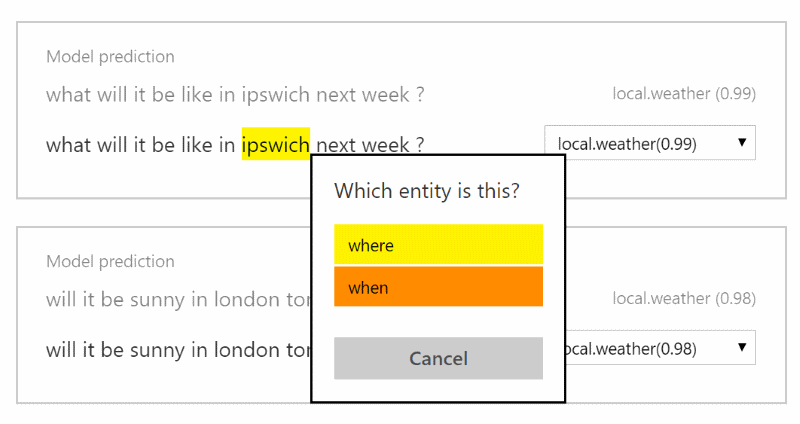 Click the plus sign next to INTENT to create a new intent; in terms of the botframework we can just think of an intent as a category which we’re going to teach LUIS to map sentences to, and extract meaningful terms from. “Utterances” are the short sentences which are used to map the user’s input to an intent. You can define many different ways of saying (uttering) something which you intend to mean the same thing. Now I’ve got an intent name – “local. news” – and an example utterance – “what’s happening in London today?” – I can hit “Save” to create this intent. We’re nearly ready to give this very basic logic an endpoint; to do this we have to TRAIN and PUBLISH the LUIS app. 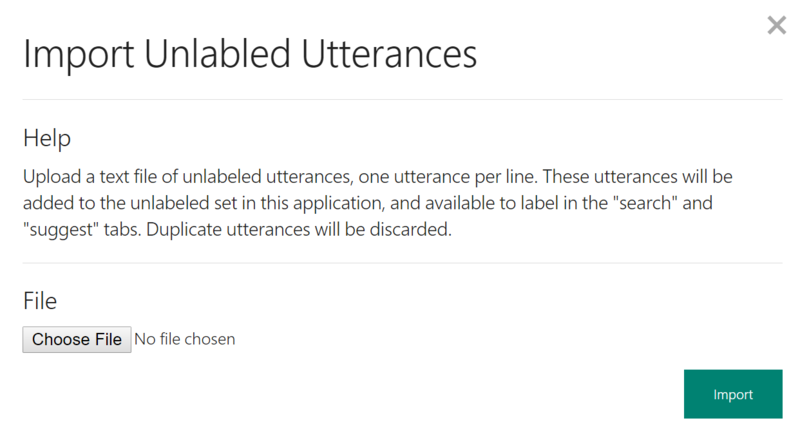 Every time you want to update your LUIS app – if you’ve added more utterances or intents for example – you always need to TRAIN and PUBLISH again. Firstly, hit TRAIN in the bottom left and wait for the spinny loader thing to finish; the more utterances you have, the longer this process takes. 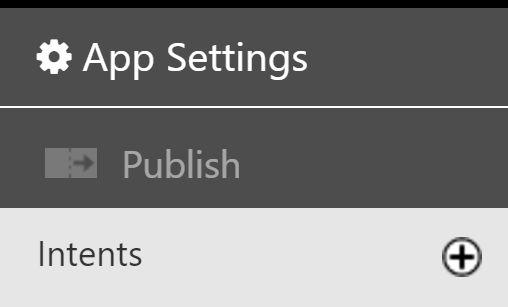 Now hit “publish web service” to create or update your LUIS app’s web service. Notice the confidence scores are really low – they’re on a scale of 0 to 1. 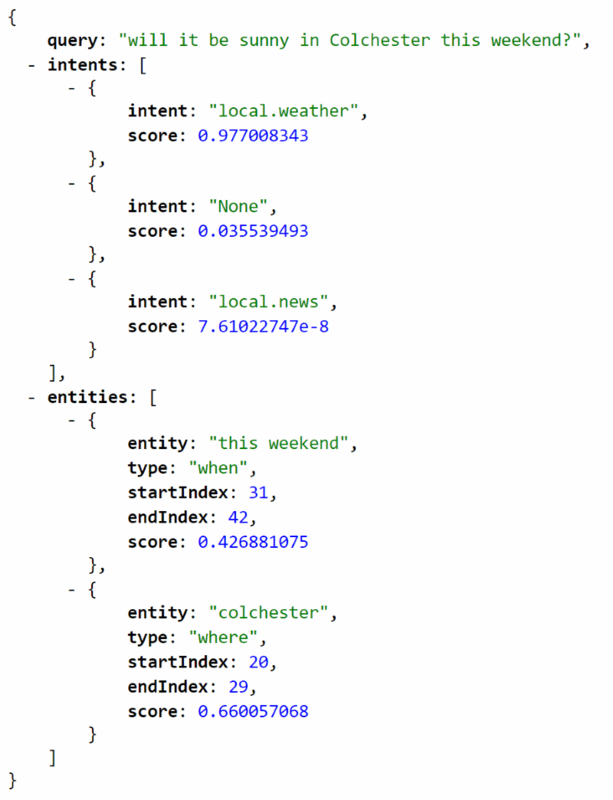 Basically, LUIS was not able to match that input to either intent with any degree of confidence, so the “None” intent got the highest score (0.28 – just above “local.weather” with 0.26, which is promising). After doing so that same sentence will now match with a confidence of “1” – i.e., super premo number one confidence! We’ve now got a LUIS app with two intents, each with two mapped utterances, and a web service endpoint to send text to and see if LUIS can map that text to an intent. Hopping back to the LUIS app’s home screen, you’re presented with a text box where you can enter more utterances to see how well LUIS maps them to intents. You can then override or set the correct intent, hitting “Submit” each time, to help teach LUIS. Once you’ve done this for a few more utterances, hit TRAIN and PUBLISH to update the web service endpoint. This is obviously a pretty manual process. If you already have a good set of input data to hand (for example, extracted from chat logs elsewhere) then this method of training your LUIS app is very inefficient. Luckily there’s the option to upload a text file of utterances directly! Hurrah! This must be in the form of a text file containing one utterance per line, each utterance being unconnected to any intent. Once the file has been uploaded, LUIS will attempt to map each one to the existing intents. It takes a bit of clicking around to find these uploaded utterances; you need to head to the SUGGEST tab, where it will gradually show you the uploaded entries along with their mapped utterances and their confidence score. It’s here that you can recategorise or confirm the terms one by one; each time you submit one the model is retraining and the subsequent utterances have higher confidence scores. Remember to TRAIN and PUBLISH when you’re done, then try querying the endpoint again with some alternative input; if the intent match is wrong or has a really low score, you can enter the same input on the LUIS app’s home screen – NEW UTTERANCES – to retrain to the correct intent. I mentioned variables in the input earlier, so let’s have a look at mapping and extracting those next. 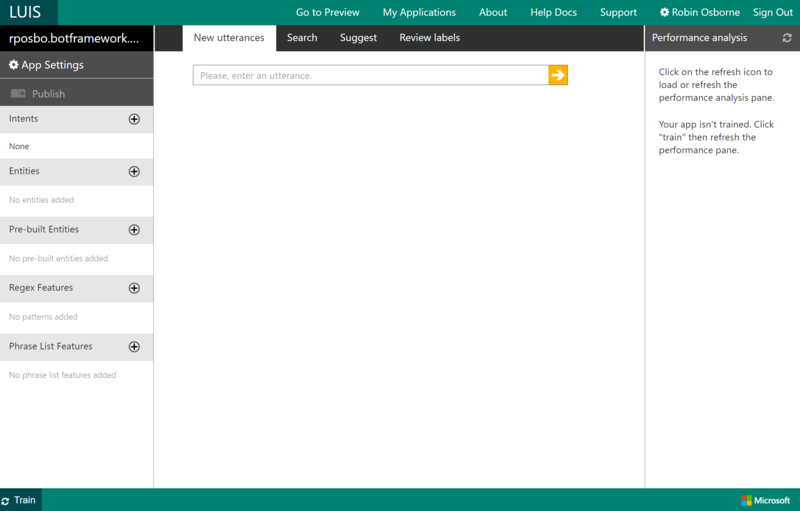 Head back to your LUIS app’s homepage and hit the plus sign next to ENTITIES. That will open the entity overlay where you can create a new entity. 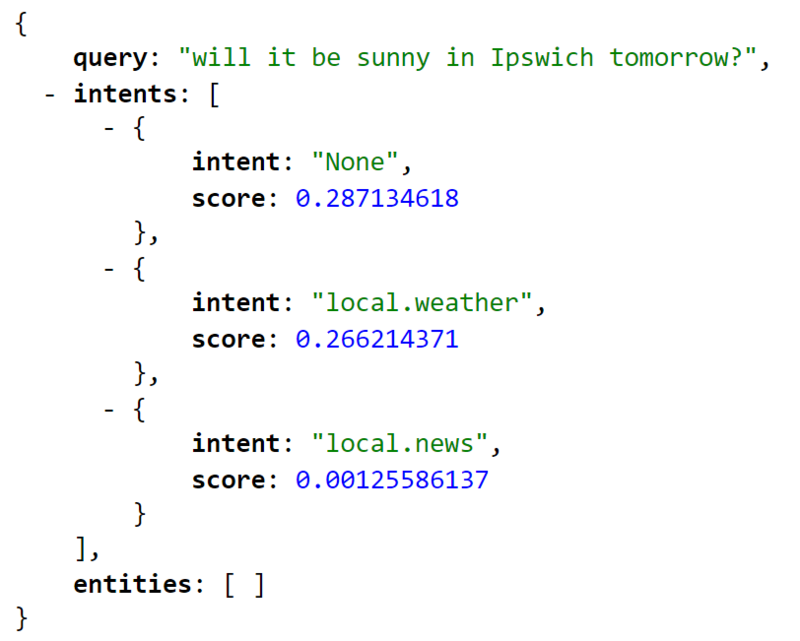 Give your entity a name and hit “Ok”; since my utterances are like “what’s the weather like in London today?” I’m going to create a “where” and a “when” entity. Now we can go back to our utterances and improve them by highlighting the entities; go to “Review Labels” and tap “Show all labelled utterances” to start enhancing them. Do this a few times and hit TRAIN and PUBLISH when you’re done. Now try searching for a new utterance, one that you haven’t explicitly defined the entities for; you should see LUIS has identified the entities for you! If not, highlight and set them yourself. You could now call this endpoint directly – using a webclient for example – and parse the response to determine the code to execute and the variables (entities) that were passed in. You can also use the built-in support for LUIS in the Botframework. We’re going to look at both of these options in the next article!